Brown bagging it is definitely not a very green approach to school lunches, and most of us probably cringe when we think of how many plastic sandwich and snack bags we used and threw away during our childhood. Luckily for us, this generation of kids has plenty of options for reusable (and stylish!) 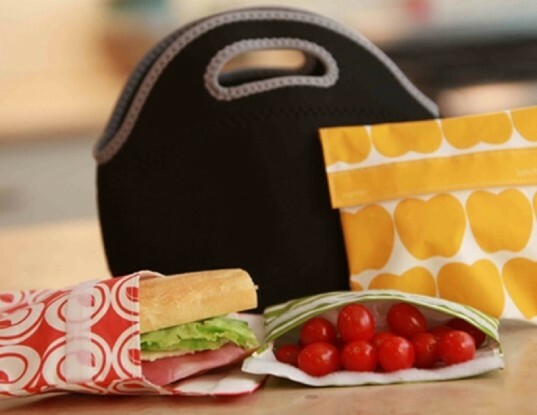 snack and lunch bag options that range from fabrics like polka dots to more eclectic options such as skull and crossbones as well as stainless steel lunchboxes and even eco-friendly bento boxes. Itzy Ritzy’s reusable and machine washable “Snack Happened” snack bags are as cute as their name and come in 18 different style options, including basic black, a perfectly preppy pink whale print, and even a blank canvas bag made from 100% organic cotton for kids to decorate themselves. The snack bags are finished with a lead-free zipper and have a PVC-free waterproof interior lining so crumbs and spills stay contained. As a way to raise some funds (and waste-free eco-awareness) for your child’s school, Itzy Ritzy even offers a custom school logo option for an additional charge. 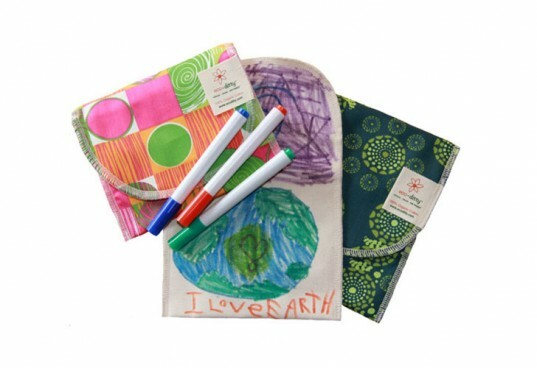 Eco-ditty’s snack and sandwich bags are eco all the way- they’re made of 100% organic cotton, printed with low-impact inks and dyes, and lined with un-dyed 100% organic cotton liners. The bags are made with a special hook and loop closure that allows you to change size of bag and also feature a fold-over design that prevents spills. Eco-ditty currently has patterns basic, bright, and nature inspired. 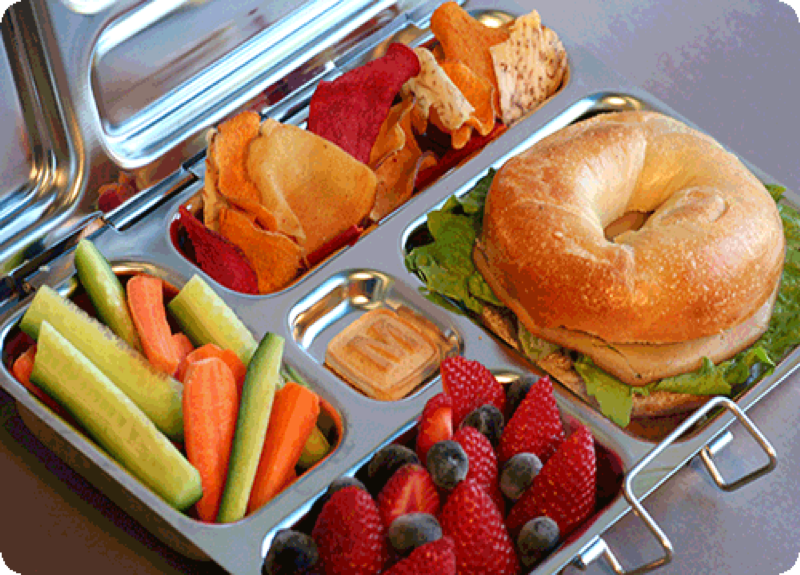 Their Back to School Set includes two snack ditties (one of which is decorate your own) as well as a sandwich ditty. We love the clean graphics and the simple lines on Lunchskins’ snack bags and sandwich bags, created by three green-minded mommies. The lightweight, food-certified cotton is hand-sewn and printed in the United States, and the bags are lead, BPA, and phthalate-free as well as being grease-proof and moisture-proof. 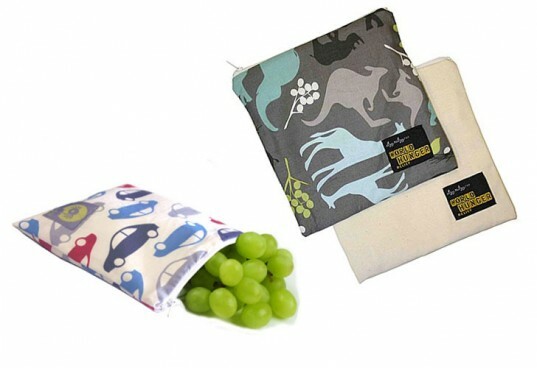 The snack bag style options include polka dots and a floral pattern, while the sandwich bags include several fruit-inspired options and animal choices (5% of the proceeds from the purchase of the crab bag goes to the Chesapeake Bay Foundation). Lunchskins are dishwasher-safe and their durability means that hundreds of plastic bags are saved whenever you use one. With a name like Semilla Snack bags, the company, of course, has snack bags, but we were even more intrigued by their snack circles, with a shape designed to enclose snacks and sandwiches that are more sticky or gooey. The circles are coated with a non-toxic nylon layer to help contain any mess. The cute outer shells are made with a blend of cotton and linen, hemp and organic cotton, or hemp and recycled polyester and feature 16 different patterns including cheerful teacups, waves, and birds and flowers in punchy colors. Get ready to chuck that rusty old Star Wars lunchbox (or simply keep it for posterity): there’s a new lunchbox in town. PlanetBox’s futuristic lunch option is made from sturdy food-grade stainless steel and is beyond well-organized, with areas and compartments created to store treats big and small. The design is especially great for kids who like to keep various foods from touching each other. We also love the Big and Little Dipper components for wet foods like sauces and dips. Kids Konserve lunch sets are as pretty as they are practical: that’s to say, very! 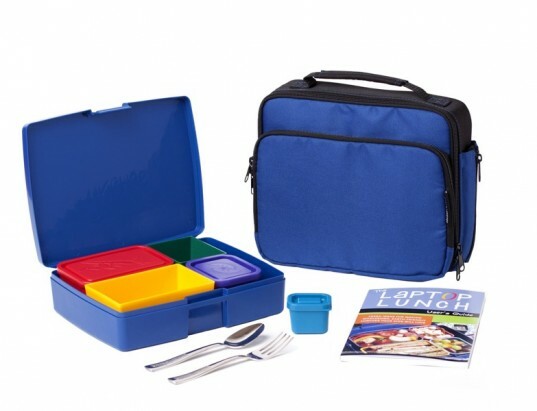 The waste-free lunch kit is comprised of stainless steel components and plastic components that are non-leaching and free from toxins such as BPA, PVC, Phthalates, and lead. The food containers, beverage bottle, napkins, and food cozy all come in a 100% recycled cotton bag that is cheekily shaped like a traditional brown bag and which is printed with plant-based inks. Anyone who’s ever been to Japan or even paged through Vegan Lunchbox Around The Globe is inspired by the adorable and functional bento box to make food to put in those cute little compartments. And that’s the beauty of the bento box design-it makes even chopped up carrots and a little handful of pretzels look like art! Laptop Lunches’ bento box options are reusable, recyclable, and free of phthalates, BPA and lead. The bento system also comes with an insulated sleeve made of 100% post-consumer recycled fabric. The bento food containers come in different mix-and-match shapes and colors and are made in the USA with 10% recyclable content. I had great luck at www.munchiessweetsandtreats.com with lunchboxes and healthy snacks with my back to school shopping. Itzy Ritzy’s reusable and machine washable “Snack Happened” snack bags are as cute as their name and come in 18 different style options, including basic black, a perfectly preppy pink whale print, and even a blank canvas bag made from 100% organic cotton for kids to decorate themselves. The snack bags are finished with a lead-free zipper and have a PVC-free waterproof interior lining so crumbs and spills stay contained. As a way to raise some funds (and waste-free eco-awareness) for your child's school, Itzy Ritzy even offers a custom school logo option for an additional charge. 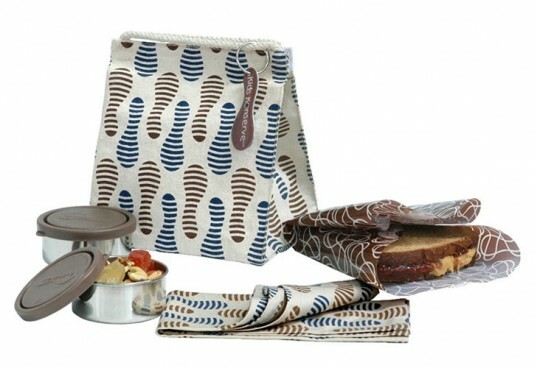 Kids Konserve lunch sets are as pretty as they are practical: that's to say, very! 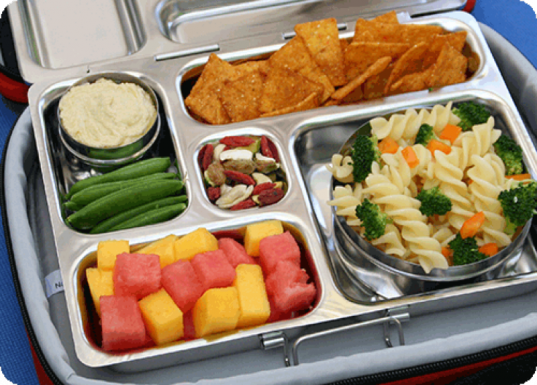 The waste-free lunch kit is comprised of stainless steel components and plastic components that are non-leaching and free from toxins such as BPA, PVC, Phthalates, and lead. The food containers, beverage bottle, napkins, and food cozy all come in a 100% recycled cotton bag that is cheekily shaped like a traditional brown bag and which is printed with plant-based inks. Anyone who’s ever been to Japan or even paged through Vegan Lunchbox Around The Globe is inspired by the adorable and functional bento box to make food to put in those cute little compartments. And that’s the beauty of the bento box design-it makes even chopped up carrots and a little handful of pretzels look like art! Laptop Lunches' bento box options are reusable, recyclable, and free of phthalates, BPA and lead. 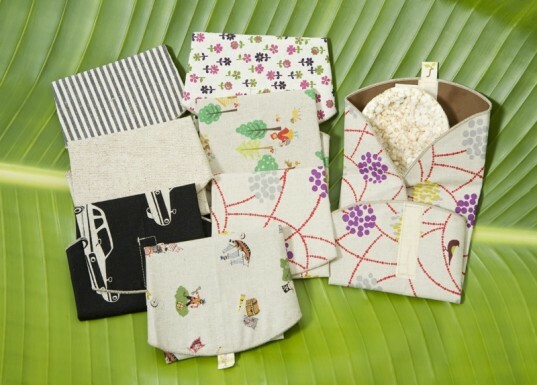 The bento system also comes with an insulated sleeve made of 100% post-consumer recycled fabric. The bento food containers come in different mix-and-match shapes and colors and are made in the USA with 10% recyclable content.